Here in Chapel Hill, NC and the surrounding Triangle area, it’s a regular occurrence to run into friends, family or coworkers who have just received a traffic ticket. Most of us understand that unfortunate feeling when the officer pulls away and you’re holding a fresh problem for you to deal with on top of a busy life. At Matthew Charles Law, we want to take the stress out of this process for you by providing a full service answer to an annoying new problem. From speeding tickets to seat belt violations, Matthew Charles Law has your back. 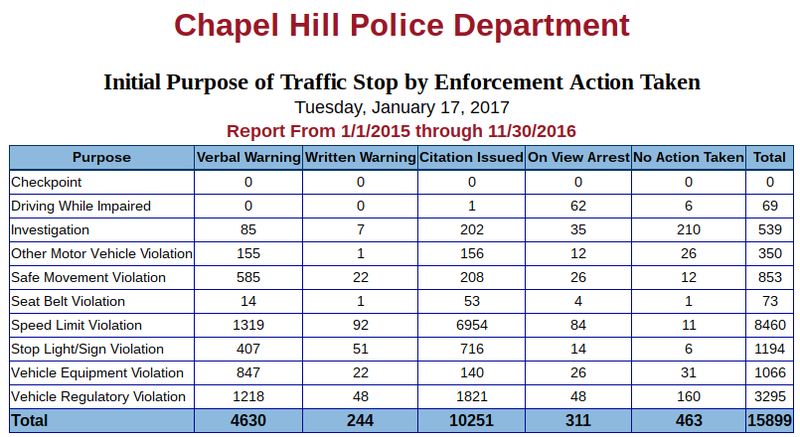 How Many Traffic Tickets Actually Get Written In Chapel Hill NC? We have a feeling, you may seriously underestimate the amount of traffic tickets given just in Orange County alone. Comparative to other areas of the state Chapel Hill ranks about average for tickets given per capita. From January 2015 to November 2016 there were over 9000 speeding tickets written alone. That’s about 13 a day! 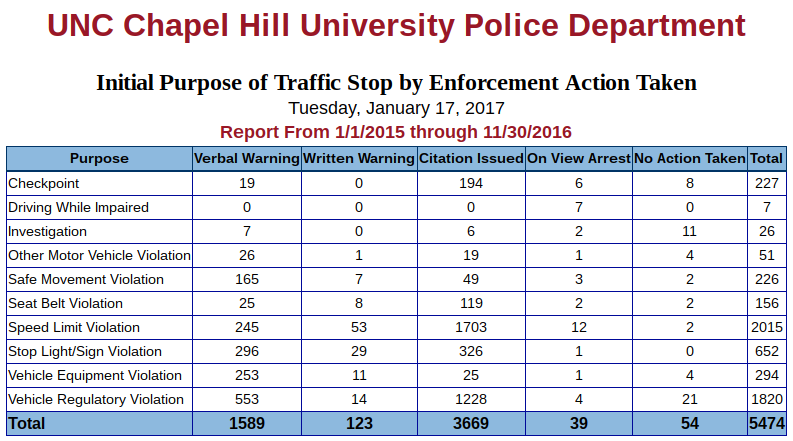 If you include all traffic violations, which number over 15,000, we are well over 20+ tickets a day written in Chapel Hill alone. These numbers have been relatively constant over the years and we can most likely expect the same rates moving forward. If you are one of the unfortunate members of this (relatively) exclusive club, make sure you handle these matters with care as driving is a privilege in North Carolina, not a right. 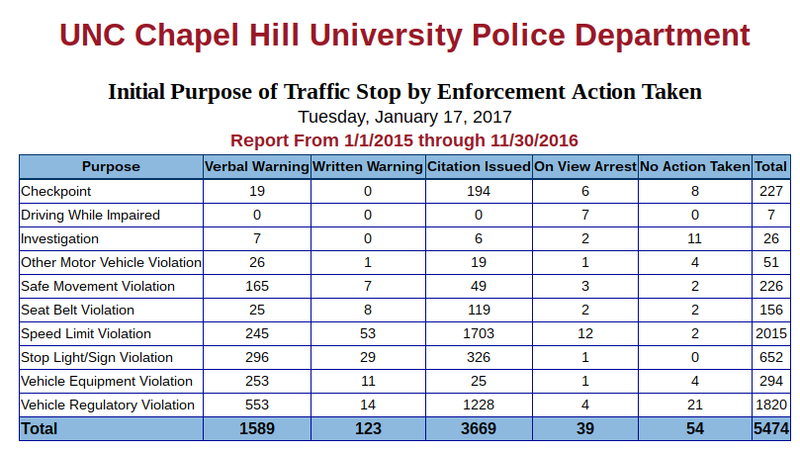 Using data directly from NC Department of Public Safety below are the actual statistics for the Chapel Hill Police Department, Orange County Sheriff Office and the UNC Campus Police from January 2015 to November 2016. Does NC Treat Traffic Violations Differently Than Other States? YES! A little known fact is that North Carolina treats ALL TRAFFIC VIOLATIONS as criminal offenses. There has been a growing trend across the country to treat traffic tickets as civil offenses but this is a double edged sword. While it may be easier to process civil offenses, in most cases, it is often much harder to defend yourself against a civil violation than a criminal violation. With criminal violations of all traffic violations, the burden of proof is different than civil cases and you may stand a better chance of fighting a traffic ticket. In states like North Carolina it is almost imperative that you hire a lawyer to be sure you do everything in your power to test the state’s case against you and traffic tickets are no different. The team at Matthew Charles Law has worked on endless traffic cases, contact us today if you want your traffic ticket handled by an experienced professional. How Long Does A Speeding Ticket Affect My Insurance Rates? Unfortunately, it’s 3 years. Here in Chapel Hill and all of North Carolina, the standard time that a speeding ticket will cause increased premiums is 3 years. Other then switching to a vehicle with a lower insurance liability there is no way to retroactively lower insurance rates after a ticket is on your record. The best way to prevent your insurance from rising is to fight the ticket with an experienced attorney by your side in the first place. Traffic tickets are proactive situations and Matthew Charles law has valuable experience fighting speeding tickets for our clients. What Happens If My License Is Revoked, Can Matthew Charles Law Help? Having a revoked license is very common in North Carolina. Matthew Charles Law has extensive experience in helping individuals with revoked licenses to get back on the road. Often times restoring an individual’s license is a long process that requires deconstructing one’s driving record and putting it back together. Also, since the law changed on December 1, 2007, it may now be possible to get a limited driving privilege even if your license is permanently revoked depending on the circumstances surrounding the revocation. Visit our Traffic Law page for more information! Need Help With A Speeding Ticket? If you’ve been charged with speeding, then it’s vital to find an attorney who will do everything in his power to test the State’s case and protect your rights. We proudly service Durham & Orange County; as well as the surrounding Triangle.